Based on a groundbreaking synthesis of recent scientific findings, critically acclaimed New York Times science reporter Nicholas Wade tells a bold and provocative new story of the history of our ancient ancestors and the evolution of human nature. Just in the last three years a flood of new scientific findings-driven by revelations discovered in the human genome-has provided compelling new answers to many long-standing mysteries about our most ancient ancestors-the people who first evolved in Africa and then went on to colonize the whole world. 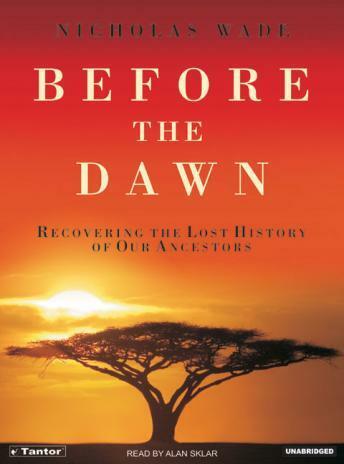 Nicholas Wade weaves this host of news-making findings together for the first time into an intriguing new history of the human story before the dawn of civilization. Sure to stimulate lively controversy, he makes the case for novel arguments about many hotly debated issues such as the evolution of language and race and the genetic roots of human nature, and reveals that human evolution has continued even to today. In wonderfully lively and lucid prose, Wade reveals the answers that researchers have ingeniously developed to so many puzzles: When did language emerge? When and why did we start to wear clothing? How did our ancestors break out of Africa and defeat the more physically powerful Neanderthals who stood in their way? Why did the different races evolve, and why did we come to speak so many different languages? When did we learn to live with animals and where and when did we domesticate man's first animal companions, dogs? How did human nature change during the thirty-five thousand years between the emergence of fully modern humans and the first settlements? This will be the most talked about science book of the season. I loved everything about this book. Great content, good narration.